Dangerous obsessions take center stage when an ex-assassin and a homicide detective race against the clock to find a missing girl before she's sold into slavery. 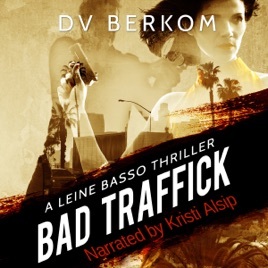 Bad Traffick named a 2012 Top 5 Indie Pick by BloodWrites and a Top Pick by Night Owl Reviews. Be sure to pick up Serial Date, the best-selling first novel in the Leine Basso series. Identified as a person of interest in three cold case murders she didn't commit, retired assassin Leine Basso accepts a temporary position as a security specialist for A-list actor Miles Fournier. Leine finds she has her hands full trying to protect the head-strong celebrity, while at the same time fighting her desire for Detective Santiago Jensen; a game she knows she can't win. Soon, a woman contacts Miles, claiming to be his long-lost sister. She confesses her 12-year-old daughter, Mara, has been abducted by human-traffickers and she's desperate to get her back, hoping that Miles will use his considerable resources to find her.